Cigarette smoking kills more than 480,000 Americans each year, according to the U.S. Centers For Disease Control and Prevention. Researchers have found that there are significant differences in smoking habits between blacks, whites and other racial groups. 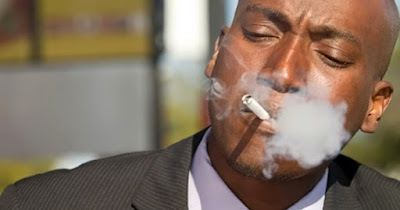 So, why do blacks have a higher risk of death from lung cancer due to smoking? They may smoke fewer cigarettes a day and start smoking later, but they are also less likely to quit smoking later in life. This means they have a longer exposure to cigarette smoke than white smokers. This puts them at a higher mortality rate due to lung cancer and other smoke-related diseases. In addition, blacks are less likely to be screened for lung cancer, which also puts them at greater risk for tobacco-related death. A recent study done at the Yale School of Public Health suggests the need to take a closer look at the differences in smoking patterns among blacks and whites in order to provide more lifesaving interventions for at-risk black smokers.